August 15 1909 -- First, my apologies for the conditon of this Herriman cartoon. The newspaper of this date that was filmed for microfilm was an awful mass of type lice, and I gave up pretty fast trying to make it look pretty. Ya takes what ya gets around here. 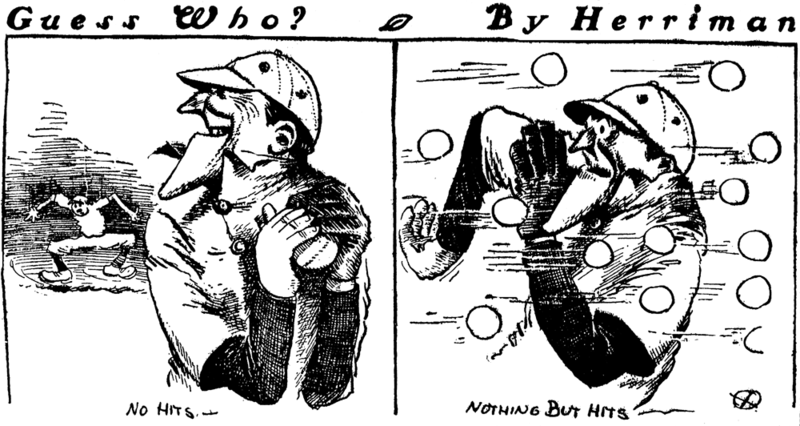 In this Herriman Guess Who episode, he might have even stumped baseball fans reading the paper that day. All we know is that the fella's a pitcher. No team name is obvious. We can also assume that he pitched a good game yesterday but faltered in the late inning ... at least that's how I interpret it. The Angels yesterday sent Bill Tozer to the mound, and he pitched a good game aainst the Seals, and was ultimately the winner, 2-1, though he did indeed have trouble in the late innings. But pictures of Tozer give no inkling of the lantern jaw Herriman is caricaturing. Ed Griffin, his Seals opponent, also pitched a good game but came up short. But I can't find any photos of him, and he doesn't play big in the account of the game I read. Hmm. How about our other local team in Vernon. Hitt the Vernon pitcher yesterday got a shutout recorded against Portland, allowing only two hits. That doesn't match the cartoon at all, and he's already made a Guess Who appearance anyway. How about his opponent, Jess Garrett of Portland? Well, he allowed nine hits, but allowed only two runs. Well, that could fit, and I found a possible picture of him in which a thin face and lantern jaw are noticeable. Okay, I'm going with him. Any dissenters? It maybe Fred Toney early in his career. Had a career defining no hitter earlier that year. My guess is he was having less luck later that season.